The pickup market is in continuous expansion and many manufacturers come with better and better products to satisfy the need of its pretentious buyers. 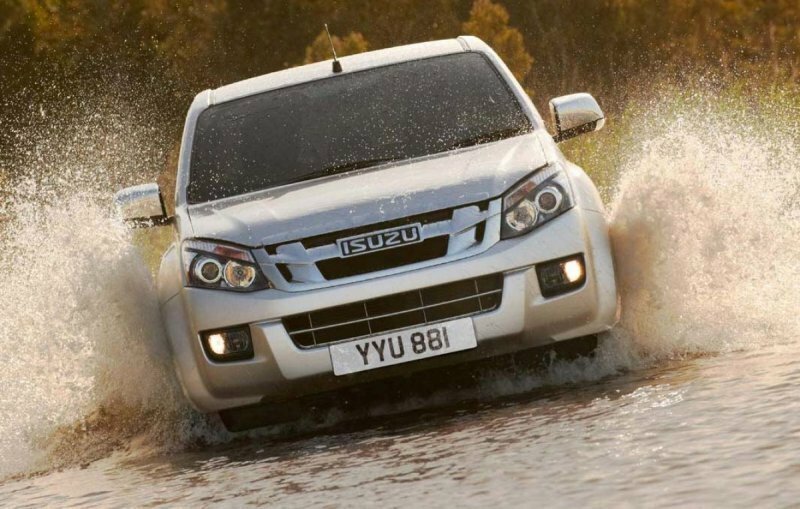 Isuzu makes no expectation and has recently launched its 2012 D Max (also known as the Rodeo) which replaced the old generation that was around since 2003. 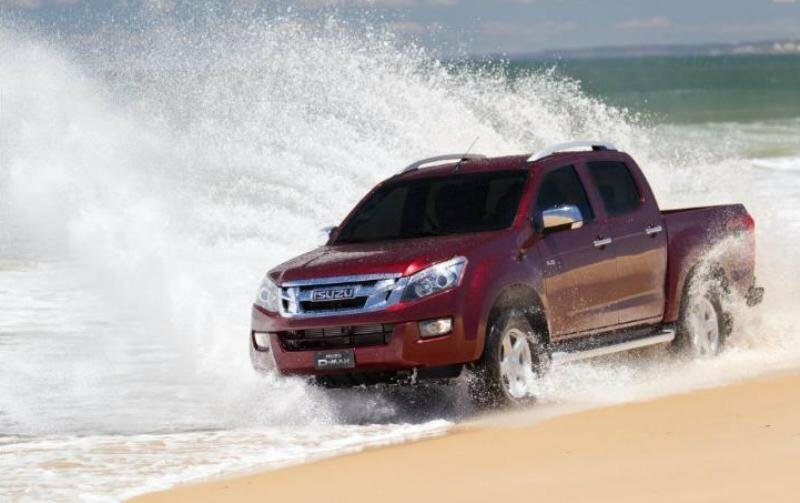 The 2012 Isuzu D-Max is based on the new Chevrolet Colorado pickup and compared to the old generation it comes with better comfort, performances and transmissions. The new Isuzu D Max it’s available in five specification levels, including a new range-topper, and three body configurations, with the addition of a space-cab body with reverse-opening ‘wing’ rear doors. Compared to the Chevrolet Colorado the D-Max comes with a different engine and a unique front styling. Unlike its sibling, the D Max it’s also available with both manual and automatic transmissions. The new D max is priced from $27,200, and has a towing capacity of up to 3.0-tonnes with a maximum payload of 1128 kg. 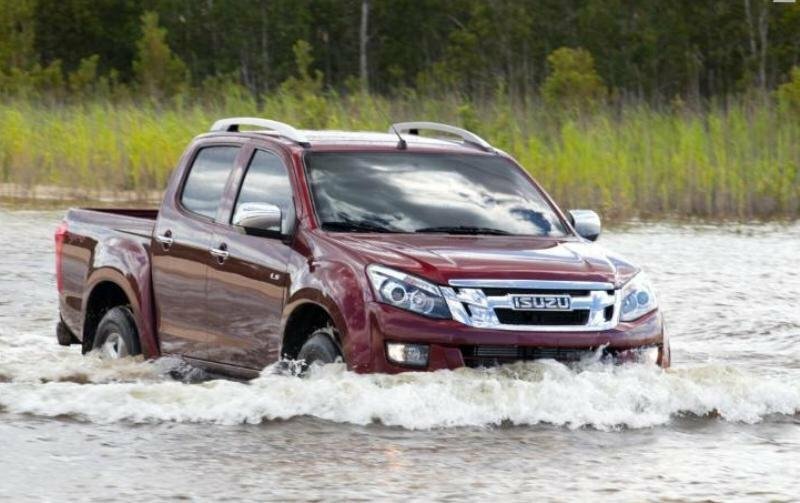 In terms of style, the new generation Isuzu D-Max received a healthy dose of testosterone which makes it look more masculine and rugged than its predecessor. The most obvious exterior change is the new headlights design which looks sharper. The grille looks pretty similar with the old one, but its gets a slightly more aggressive style. The hood was also redesigned and now comes with four cresses instead of two. The exterior modifications continue with the front bumper that was completely reshaped, but it continues to keep the same big air intake and the twin fog lamps as the old one. The side view reveals a pair of new, more muscular fenders and reshaped mirrors. The new exterior style is matched by a similarly new interior design. The previous model had a pretty robust cab, but the new generation comes with a welcomed touch of sportiness which makes the cab feel more upscale than it really is. The materials are also much better than expected and from place to place you’ll be even find some soft touch surfaces unlike the old cabin that was all fitted only with hard, cheap looking plastics. There are also nice metallic accents that can be found across the cab which break up the monochrome monotony. The new air vents look fairly good, while the center console features an attractive “V” shape “flowing” towards the gear knob. As it was expected, the cabin is fairly spacious and treats you with plenty of leg, head, and shoulder room. It won’t be hard to notice that the 2012 cab is fairly more spacious than the old one, as it’s both longer and wider offering a car-like comfort. The front seats aren’t a big improvement over the old ones, but they do offer decent comfort and have enough adjustments to help you find a proper position in no time. The new D Max is available with a rear wing door configuration that opens out to a wide 90-degree angle, offering easy access to the rear compartment. The rear seats offer decent comfort and they can also be folded to offer additional space. Storage isn’t a problem and you’ll find plenty of cubby holes to store your things safely. 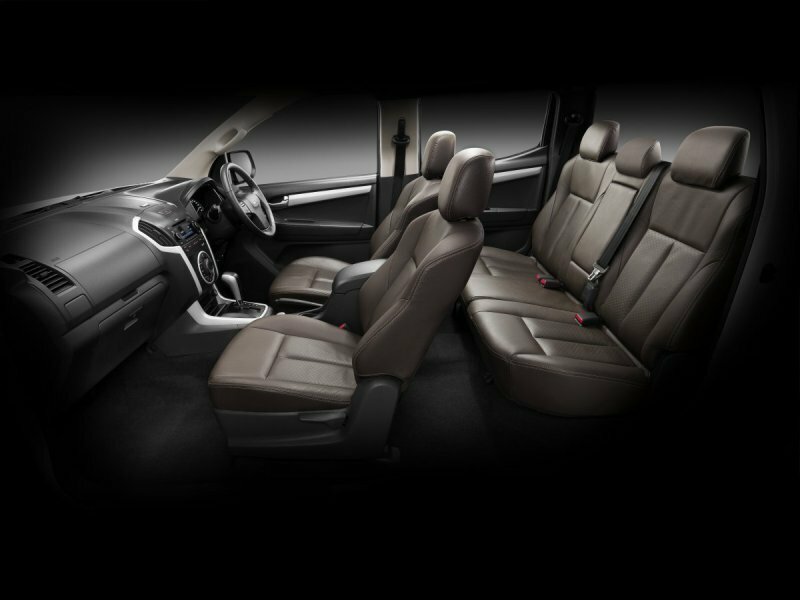 The D Max cab is packed with an optional audio system with USB Flash Drive, touch screen and Bluetooth Connectivity. Power comes from a 2.5 liter diesel engine which is big improvement compared to the old unit. This unit is surprisingly refined and there isn’t felt any diesel clatter at idle. The maximum torque is rated at 400 Nm and it’s available between 1400 – 2000 rpm. Step a big to on the go pedal and you’ll be rewarded with a strong and punchy response mostly and a wide torque band. The engine does its job in a great way and pulls any load without breaking a sweat, never feeling strained. It’s true that there are more powerful engines out there, but the D Max’s unit is well matched to its chassis. The five speed manual gearbox is able to shift gears pretty easy, but there is pretty long throw between them. The automatic unit it’s a bit sluggish for our tastes and needed shorter gear ratios for better performances. The new generation D-Max ladder frame is 42 percent more rigid than the old one and the new model has also a wider track, hence increasing the stability not only on difficult terrains but on normal roads too. Thanks to this improvement, the vehicle feels well balanced and stays planted on its wheels with more determination, even during harder cornering. The new Isuzu D-Max also benefits from a new suspension setup with independent double wish-bone with coil springs and gas shock absorbers up front and long-span leaf springs at the rear. While the old model find it hard to keep your back away from the biggest potholes, the new suspensions are more forgivable and offer a slightly better ride quality. With the new D-Max, Isuzu has showed everyone that it’s back in the pickup business. While the old model didn’t had enough grunt to keep its head up against its main rivals, the new model is a quantum leap forward for the Isuzu brand and represents a pretty interesting package that is worthy to be taken into consideration. 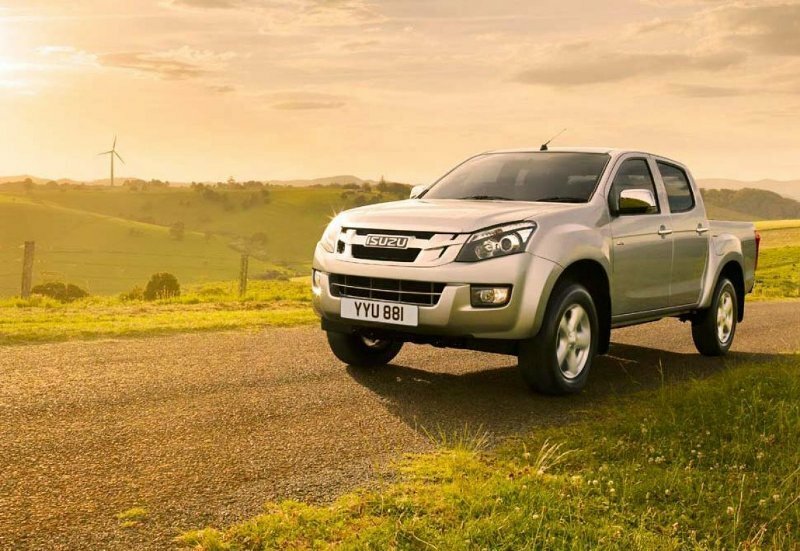 The 2012 Isuzu D-Max offers a modern exterior design, which is backed up by a fairly spacious and decent cabin. The diesel engine may not be the strongest unit in the segment, but it gels great with the utilitarian nature of the vehicle and offers adequate performances. The vehicle comes pretty well equipped too and the price won’t scare buyers away either.